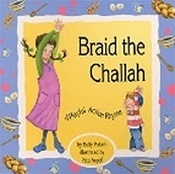 Braid the Challah shows exactly how a bowl full of batter turns into a beautiful challah... while a cheerful group of small children demonstrate the actions that go along with each step. They spin like a mixer, stand on their toes as they rise, and pinch off a piece of dough for the mitzvah -- What fun! I Can Make a Bracha Board Book I am a Torah - A Playful Action Rhyme Going on a Hametz Hunt It's Tu B'Shevat!